Bao Loc is in Central Highlands (Vietnam). 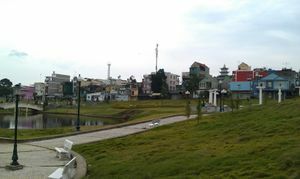 Medium-sized city that sits on Highway 20 between Ho Chi Minh and Da Lat. This serves as a good resting stop if traveling on motorbike with many cafes and hotels with free wi-fi. The park in the middle of city is quite nice. There's a lake (hồ Bao Loc) in the center - a common place for locals to spend their weekend fishing. This makes a nice photo with the lake in the front and Vietnamese apartments (and a temple) in the back. There's not much to do other than eat, sleep and enjoy the little park. There's a very popular vegetarian restaurant on Highway 20 (aka Tran Phu) and Nguyen Van Troi, called Quan Chay (or Quan Che on Google Maps). There are many hotels near the park and the lake (hồ Bao Loc). Tu Hung, 88 Ly Tu Trong, 0633864037 Good sized rooms. Clean bed and washroom. Allows parking (motorbike) inside the hotel < 130,000 dong for a single room. Take Highway 20 to Da Lat (North) or Ho Chi Minh (South). This page was last edited on 31 May 2013, at 06:51.